The Turkish lira rebounded Tuesday against the dollar, a day after the central bank took a raft of measures in a bid to soothe the markets. The lira was at 6.49 to the dollar and 7.41 to the euro, well off the 7.24 to the dollar and 8.12 to the euro seen Monday. The unit has lost about a fifth of its value against the greenback since Friday. Turkey’s central bank on Monday announced it was ready to take “all necessary measures” to ensure financial stability after the collapse of the lira, promising to provide banks with liquidity. Treasury and Finance Minister Berat Albayrak, son-in-law of President Recep Tayyip Erdogan, will speak with about 1,000 foreign investors on Thursday via a teleconference, the private NTV broadcaster said. 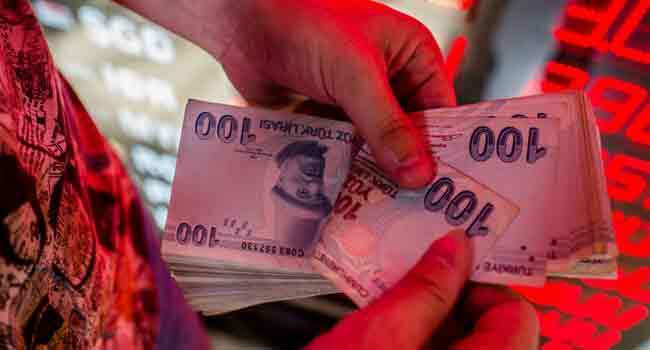 Rapid growth fuelled by foreign funds and relatively low-interest rates have built up imbalances in the Turkish economy, setting the stage for the lira’s plunge. The trigger has been a diplomatic crisis with the United States over a number of issues including the detention of an American pastor. US President Donald Trump imposed sanctions on Turkish iron and steel exports, in a series of punitive actions for Ankara’s refusal to release the pastor, who is currently under house detention on terror-related charges and espionage.